The Capitol Square Review and Advisory Board and the Capitol Square Foundation unveiled the 2009 Great Ohioans during a ceremony at the Ohio Statehouse. The 2009 honorees were unanimously approved by the full boards of the Capitol Square Review and Advisory Board and the Capitol Square Foundation. The honorees were selected from nominations submitted by individuals and organizations throughout Ohio. The 2009 Great Ohioans include: Catherine Nelson Black (Columbus), health care humanitarian; Salmon P. Chase (Worthington), Ohio Governor, Secretary of the Treasury and Supreme Court Chief Justice; Paul Laurence Dunbar (Dayton), poet and author; Charles F. Kettering (Loudenville), inventor; Eddie Rickenbacker (Columbus), World War I fighter ace; and Denton T. "Cy" Young (Cleveland), baseball legend. The Great Ohioan Award commemorates special Ohioans who have played a significant role in an event or series of events of lasting significance in World, American or Ohio history. Additional criteria includes being born in Ohio or lived in Ohio for a minimum of five years and at least 25 years have passed since the event, in which the nominee participated, is being commemorated. Since 2003, ten Great Ohioans have been recognized with the award for the special roles they played in history. The Great Ohioans include: Wright Brothers, inventors; John Glenn, first American to orbit the earth; Neil Armstrong, first man to walk on the moon; Jesse Owens, Olympic track and field star; Thomas Edison, inventor; Harriet Beecher Stowe, author; James Thurber, journalist and author; Colonel Charles Young, military leader; and Dr. George Crile, founder of the Cleveland Clinic. A special exhibit will pay tribute to all Great Ohioan Award recipients at the Ohio Statehouse Museum, currently undergoing a multi-million dollar renovation to be completed in June. 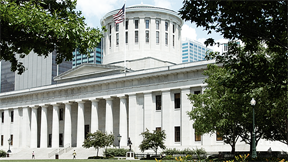 The Capitol Square Foundation has raised more than $2.25 million in private donations for the updated exhibits and an enhanced education program at the Ohio Statehouse. Information about the new Ohio Statehouse Museum is available on the Ohio Statehouse Web site at www.ohiostatehouse.org.